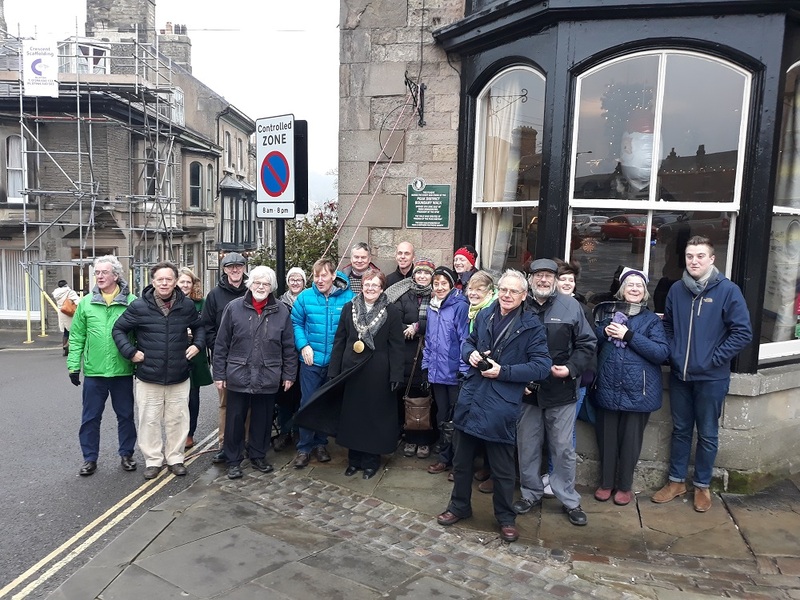 Friends of the Peak District volunteers and boundary walkers, gathered together with representatives from the Buxton Town Team, Buxton Vision, Peak & Northern Footpaths Society and the Peak District National Park Authority at the Kings Head pub on Buxton’s Market Place on Saturday morning as High Peak Mayor, Cllr Linda Grooby, unveiled the Peak District Boundary Walk plaque. On a day of rare freezing rain, the weather couldn’t be more different from the hottest day of 2017 on Saturday 17th June, when the walk was ‘launched’ amid much fanfare and the presence of eight local mayors! We would like to thank everyone who attended the plaque unveiling ceremony; and to thank PNFS for sponsoring the plaque and the Kings Head for hosting us.